In Ubuntu, Xubuntu and Lubuntu 18.04 Bionic Beaver, daily builds of March 25, the right default keymap isn't preselected when you select "Nederlands" (i.e. Dutch) as language for the installation. "English (US) - English (US, intl., with dead keys)". This is a regression, at least compared with Ubuntu 16.04 and earlier (I don't know about 16.10, 17.04 and 17.10). I can confirm the same bug in Ubuntu 18.04 and Xubuntu 18.04 (daily builds of today). I'll update the bug description accordingly. Subscribing the Desktop Team, maybe they have some information that will lead to an easy fix. If I install Ubuntu in Swedish, I expect the installer to propose the basic se keyboard layout, which it also did previously. So I'm a bit surprised to hear that you would like it to suggest us+intl in the case of a Dutch installation; I would have thought you'd prefer it to pick the basic nl keyboard layout. Anyway, the pre-selection of keyboard layout seems to be broken. Whichever language you pick, the basic English (US) layout is suggested. Previously the window for setting keyboard layout showed up after you had selected the time zone, but is now the first window you see when clicking the install button. It may have something to do with it, or not. 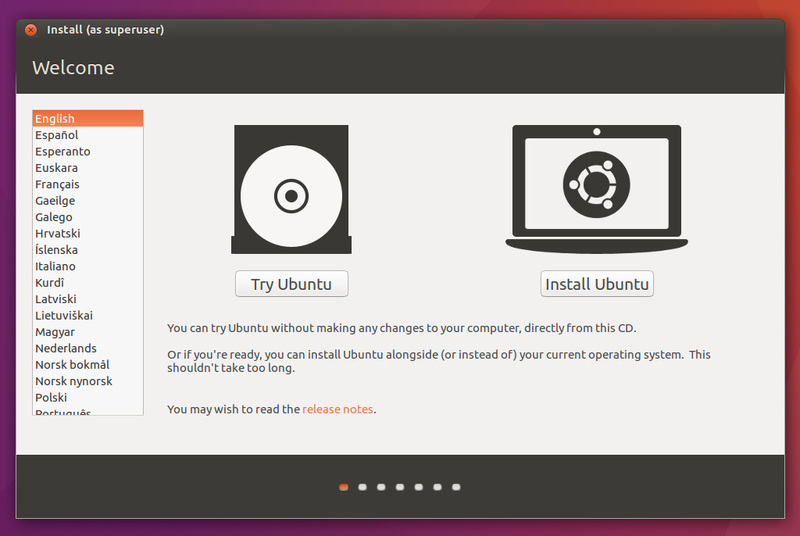 "Try Ubuntu" is broken in this respect as well - I don't want the English (US) layout when trying in Swedish! I subscribed Mathieu Trudel-Lapierre and Jean-Baptiste Lallement, who both have made changes to ubiquity lately. Also raised the importance to "High" - I think this is an important issue; bad first impression for most non-US users. Thanks for helping to bring this matter to the attention of the right people! I can confirm that it's a regression compared to 16.04. On 16.04, if the selected language matches the time zone location, a reasonable guess is pre-set in the window for setting keyboard layout. So if I select Nederlands and pretend to live in Haag, the installer indeed suggests the us+intl layout. This behavior was broken in 17.10, and I have a feeling that it's related to the switch from unity-settings-daemon to gnome-settings-daemon. which handles it for some locales which typically need input methods. But for all other locales it simply defaults to the basic English (US) layout. As already mentioned, this may make the live session for many (most?) languages disappointing. Typing is an essential part of the desktop experience. OP said that this also affects Xubuntu and Lubuntu so its not likely only gnome-settings-daemon involved here, since neither of them use it. - where do you pick the language? on the syslinux first text based boot? or in the installer? - do you use the install only mode or the live session? - is that specific to that language or do you see similar issues in other locales? Sebastien Bacher: what happened on your system is the right result, but that's not what happens on my machine.... Still not, when I use the latest daily Ubuntu iso (timestamped 20180-04-03 07:03). - I boot my laptop from the iso. - it shows only the normal Grub-like "terminal" lines, no GUI, with "Try Ubuntu without installing" as first line of the four. Which is normal for UEFI. - In the welcome screen of Ubiquity, I select "Nederlands"
- I'm being presented with the wrong preselected "Engels (VS)" keyboard layout, like I described in the opening message in this thread. Just tested some other languages: exactly the same error happens when I select Deutsch, Francais, Espanol or Italiano. They all present English (US) as default preselected keyboard layout. @Sebastien Bacher: have you already tested it with a UEFI machine running in full UEFI mode, on the bare metal (not in VirtualBox)? For the sake of completeness, I repeated the test with the latest daily build of Xubuntu Bionic (timestamped: 2018-04-04 06:05). Again: the Xubuntu iso shows precisely the same results as with the Ubuntu iso. I'm able to reproduce Sebastien's success by following the steps in comment #9. So it seems like the language must be selected before Ubiquity boots to get a reasonably guessed preselected layout. does not mention the syslinux menu either. The desired behavior is reasonably that when you change the language on Ubiquity's welcome screen, the preselected layout should be changed to match the selected language (just as the display language is). Btw, with the press-a-key approach, "Try Ubuntu" enters a session with the correct layout in /etc/default/keyboard. So yes, this is probably a pure ubiquity bug, not affecting gnome-settings-daemon. From the logs it seems that even if the locale is set to a non-english language, the config variable xkb-keymap introduced in 17.10 is set to 'us' and Ubiquity uses this value to update the UI. I think I finally understand how the whole default-keyboard configuration is done in ubiquity and console-setup. The reason why it's busted is indeed the keyboard-configuration/xkb-keymap debconf variable. The reason everything worked up until artful was that before artful we have been reverting the xkb-keymap pieces from keyboard-configuration.config because of ubiquity (mostly), and this change was dropped with the artful console-setup merge with Debian. I'm trying to ask around if that was intentional or not. If it was, then we need to handle setting of xkb-keymap after performing language selection (possibly in ubiquity). If not, then we'd have to remove it - or at least the pieces where xkb-keymap is overriding all locale/country-based default keyboard layout selection in console-setup. I talked with cyphermox and it seems the delta was removed intentionally - with the intention of just starting to use xkb-keymap in ubiquity - but this cycle that didn't happen. Since it does require a small amount of design work and we're really close to release, it's best to just re-introduce the changes. I'll be uploading as soon as I have a moment. There was a misunderstanding there: I never suggested we should use xkb-keymap instead (or at least, that's not the message I was trying to convey). The intent was to reduce delta by not removing so much code, when console-setup merges are already difficult. I didn't foresee that some of that code setting a default would impact ubiquity (because ubiquity does things specially with d-i components, sometimes running them multiple times). There's always a need to update ubiquity after changing d-i components; it's inevitable since some of them are embedded in ubiquity source. The removals of xkb-keymaps aren't ubiquity-specific: we don't use this code in d-i, and instead use multiple screens to change keyboards. That's a conscious decision. The point for supporting xkb-keymap "in ubiquity" is more about making sure that we either "rebuild" the value based on layoutcode/variantcode, or otherwise unset it before running the configuration script -- ie. leave it in, but just explicitly ignore its values. I was just saying that if the decision was made to keep xkb-keymap then there had to be a decision to start using it implicitly in ubiquity. And by 'using' I didn't just mean the literal sense of us using the value explicitly, but acting accordingly to what consequences it brings - as it requires us to do one of the two as you mentioned in your post. So I don't think there's much of a misunderstanding here. It's all good and I guess for the next merge we should proceed with adjusting things so that ubiquity is happy with the changes.